Last week I had the chance to run Rick Spencer’s Test Sprint. In Canonical-jargon a sprint is normally a 1-week workshop around a specific topic. In this case the topic was Automated Testing, hence my team was participating in the sprint. Rick had provided 3 main goals for the sprint. Creating a backlog around these seemed overkill so I decided against it. This is probably the case from most workshops – if you have so many goals that you need to prioritise them into a backlog, then the workshop is probably lacking focus. My approach was to split this into pre-sprint homework and a 2 hour session on the morning of the first day. The pre-sprint homework consisted on people getting together online to break down the 3 top goals into tasks and deciding what could be done. This helped focusing people’s mind in the problem, but at the end of the week most of the task created during the sprint were replaced or chucked away. The planning session at the actual sprint was really good. It made sure people had the same expectations of what needed to be achieved on during the week, and it help building up a very useful set of tasks to get there. From the start, this was a definitive yes from me! Having a demo at the end of the week meant that we all walked away understanding the accomplishments and short comings of the work achieved during the week. It also helped us decide on the next steps to follow after the sprint. Having only a week to work, it was very important to me that communication was not an impediment. Also, that I was not interrupting engineers with status reports: “So, what are you up to?”. I scheduled two stand-ups per day: First thing in the morning and first thing after lunch. While having stand-ups (IMHO) worked great, I am still unsure if 2-a-day was really needed. It felt that some days it really made a difference (specially at the start of the week) while others there wasn’t that much to talk about at the second meeting. As this workshops tent to be a one-off, I decided not to this. 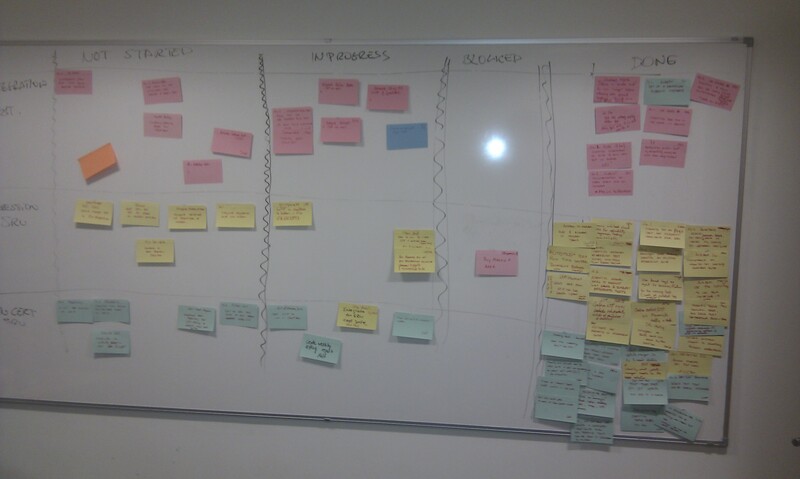 We do run sprints regularly, so it might be worth it to do a retrospective on ” how to organise a sprint”. But definitely do this offline, no need to spent valuable face to face time. My experience of physical Task Boards is that they are great at focusing the team on making progress and tackling blocking issues. Having everyone in the same room, it seemed that a Task Board was ideal. And it worked great! Use index cards and not post-it notes – trust me on this one. Use Sharpies. Normal pens are too small so people end up writing too much in the cards, while whiteboard markers have the opposite effect. Keep it simple. I would recommend to have only 4 columns: Not Started, In Progress, Blocked, Done. This for me was a must, specially as we had volunteers from other team attending. The last thing I wanted was to push people into tasks they did not want to do.